I didn't have any buttermilk, so I just used milk and vinegar to get the same effect. This time instead of pure maple syrup, I tried just the maple essence. I was trying to make a drier scone, so I didn't want to add to many liquids. Try not to eat all the bacon as you crumble it up to throw it in the mix. I know it is a challenge, but you can do it. I rolled the dough into a ball and flatten it out by hand. Don't use a rolling pin because it will affect the texture of the scone after it is baked. I have learned this from experience. Before putting these in the oven, I sprinkled them with cinnamon and granulated maple sugar. I bought this container in Nova Scotia, but I did see some in the baking aisle at my supermarket the other day, so you should be able to find some in stores. If not, just add the cinnamon. Oh yeah, baby. These look good. Of course you can't beat the smell of maple and bacon. Now you can leave these as are, but what fun would that be. 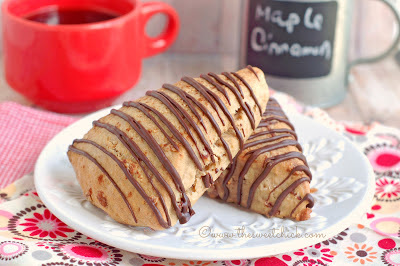 Since I added chocolate to my Maple Bacon Rice Krispie Treats, I though why not add some to my scones. I had some Baker's chocolate on hand, so that is what I used, but feel free to use whatever chocolate you have on hand. I used a piping bag to make my stripes, but you don't need to be all neat. You can just drizzle with a fork. Yep, these are definitely keepers. The have just the right amount of maple and bacon flavor. They are not too sweet and they are on the drier side, for those of you who like a drier scone. They do crumble. And the chocolate just takes them over the top. In a small bowl add vinegar to the milk and set aside until it forms curds, about 5-10 minutes. In a large bowl, mix flour, sugar, baking powder and 1 teaspoon cinnamon. Cut up butter and add to flour mixture. Then add egg, milk mixture, and maple essence and mix until completely incorporated. Next mix in the crumbled bacon. The batter will be a dough like consistency. Sprinkle the top of the triangles with the remaining 1/4 teaspoon cinnamon and the granulated maple sugar. Bake at 425ºF for 15 minutes or until tops are golden. 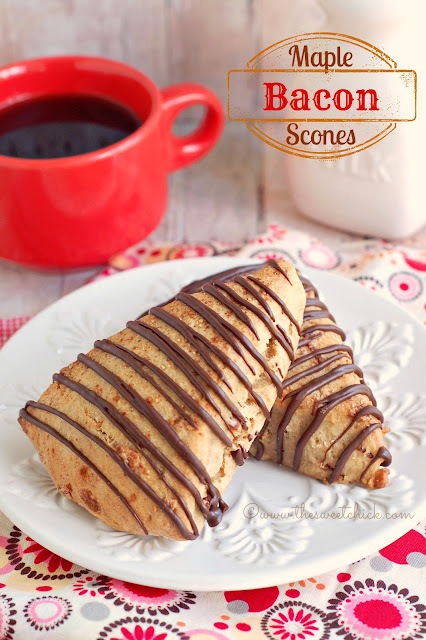 When scones have cooled off, melt the chocolate in a glass container in the microwave at 30 second intervals until completely melted. Place melted chocolate in a piping bag or a Ziplock bag with tip cut off and drizzle over the tops of the scones. Let the chocolate set and then it's time to eat and enjoy! These look and sound amazing! Thanks so much for joining in on Whimsy Wednesdays. I'm sharing on G+ and Facebook. Interested to join? 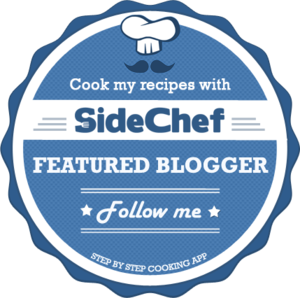 Then Please register your food blog and start submitting your recipes. These scones look so yummy! love the way you decorate with chocolate ganache. Thanks Jeannie. I always like to add a little chocolate!